An Auckland Vegan – Food and other good stuff for vegans in Auckland, New Zealand. I keep seeing vegan appended to fashion and food options in magazines like it’s the new big thing. Newspapers alternate between extolling the ethics of vegan lifestyles and bemoaning our lack of nutrients and manners. We’re this year’s crossover pop hit, you guys! 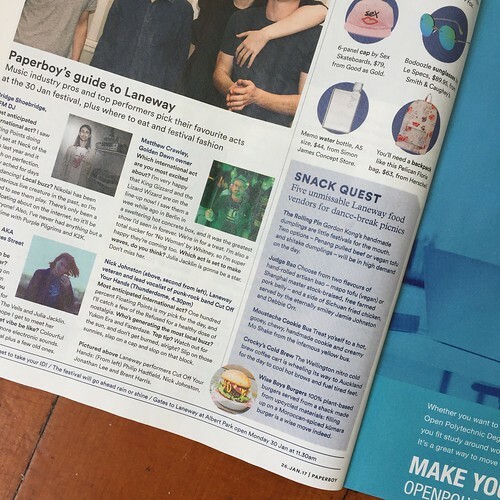 Today’s example of this: Paperboy‘s piece about food at tomorrow’s Laneway Festival dropped vegan twice (and “plant-based” once) into a short five-point listicle; all five of their suggested food carts are solidly vegan-friendly. 1. Tofu and shiitake dumplings from The Rolling Pin, one of a handful of dumpling carts that have popped up within the last couple of years that have vegan options. I haven’t tried The Rolling Pin’s offerings; please leave your reviews in the comments. 2. 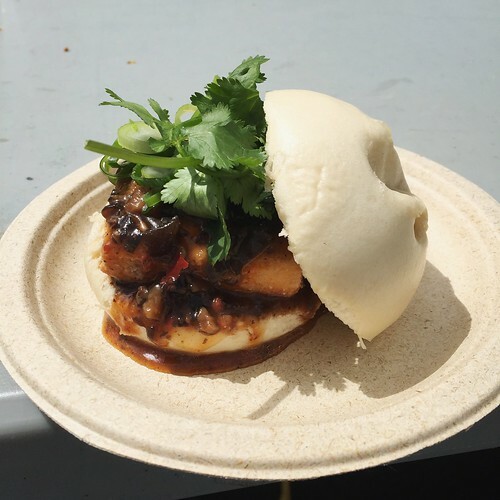 The Sloppy Po bao from Judge Bao: not vegan by default, but you just have to ask and they’ll leave off the mayo. Ma po tofu, mushrooms, spring onions & coriander. Delicious. 3. The bus outpost of Moustache Milk & Cookie Bar, which has come a long way since I wrote about them in 2014 and now offers the full vegan milk and cookie experience: a double chocolate vegan cookie, coconut or soy flat whites & hot chocolates, vegan cookie cakes, and five flavours of milkshake: chocolate, peanut butter, oreo, espresso & coconut. I don’t know how much of this range they bring with them on the road, but you should be able to find some kind of vegan sugar. 4. 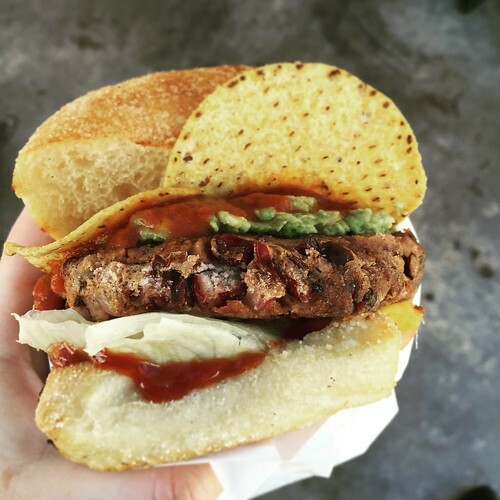 Burgers and fries from Wise Boys, who are all-vegan, all the time. They make a range of delicious, fresh, huge burgers, and excellent chips with homemade lemon aioli. 5. Coffee! There are probably a few options, but two that sound good are Crocky’s Cold Brew from Wellington, and coconut iced coffee made by Atomic with Little Island coconut milk. 6. 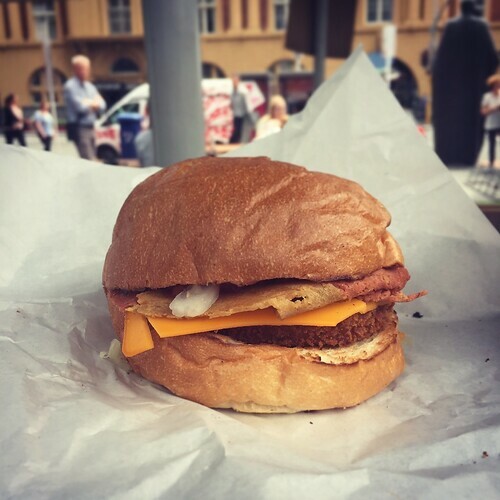 Recent Melbourne imports Lord of the Fries with their all-vegetarian, vegan-options-for-everything range of burgers, fries, hotdogs and milkshakes. My favourites: Chick’n burger, fries with Parisian sauce (garlic aioli), peanut butter & chocolate milkshake. 7. And last but not least, festival fried-bread stalwarts Langos, who have added a couple more vegan options to their range in recent times, including a sweet version with banana cream. 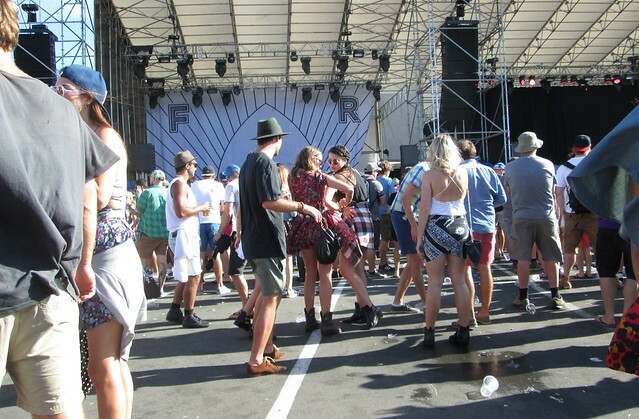 If you’re going to Laneway this year, have fun, eat well, and let me know what your favourite vegan find was.